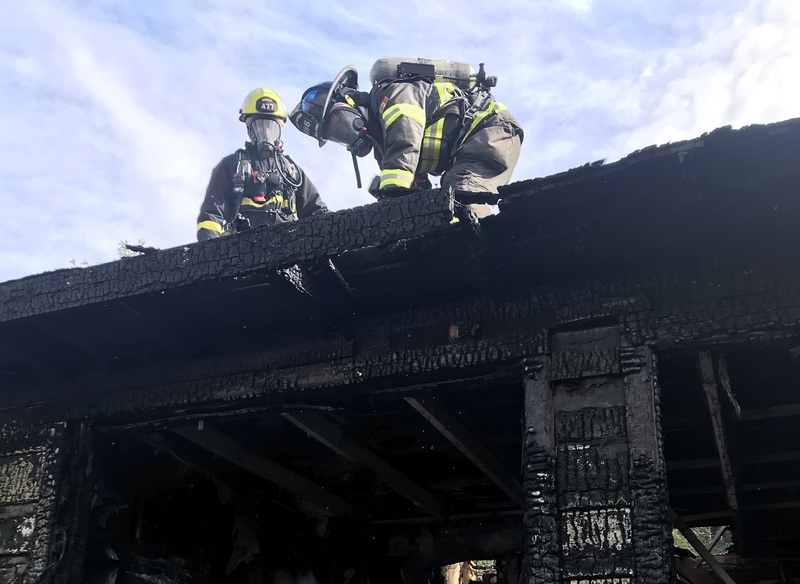 Two members of the Powell River fire department work on a home that burnt in the Townsite area on September 11th, 2018. Image courtesy of the Powell River fire department. 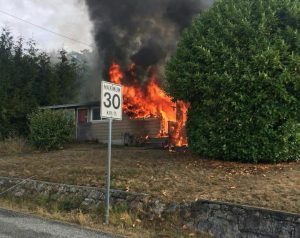 POWELL RIVER, B.C- A family in Powell River had a close call in a house fire this morning. According to Powell River Deputy Fire Chief Rocky Swanson, firefighters first responded to a report of smoke from a home along Willow Avenue around 9:30 a.m. 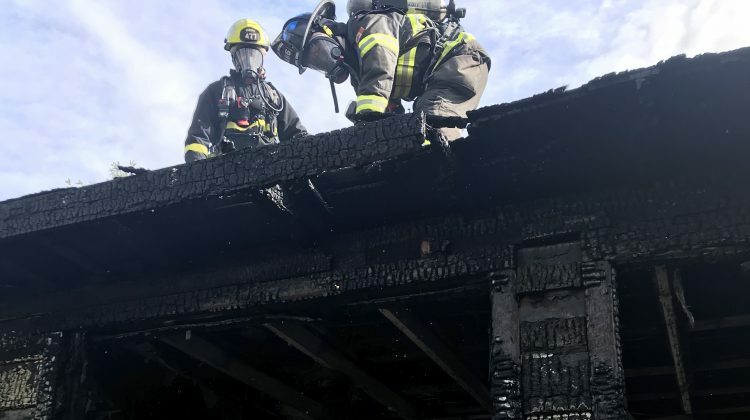 Upon arrival, they found a one storey duplex getting consumed by flame, with fire shooting out of all the windows and black smoke pouring from the building. A photo of the fire, sourced from the Facebook account of Ken Palfrey. Two adults and one child who lived in the home were present at the time of the fire, along with a neighbour in the next unit. All four escaped, with the three taken to hospital for further observation. “It was an incredibly close call,” said Swanson. Two cats were also rescued, and firefighters are looking for a third. The family’s home has been totally destroyed, and they will be taken care of by the Red Cross in the aftermath of the blaze. The exact cause of the fire and it’s origin point has not yet been determined. Swanson also had words of praise for the emergency responders in Powell River, with all services arriving to the scene quickly. “Everybody in town can be really proud of that,” said Swanson.